My Review of the Concert DVD: That was totally awesome. 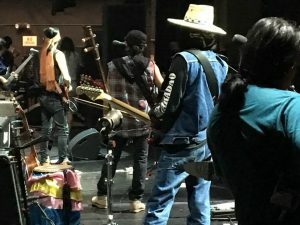 Like the 30th anniversary concert, they played almost 50 songs over 3 hours, with half of those strung into one long medley, with time for just one or two verses of each. There was almost no talk, they just transitioned from one song to the next. As the title suggests, the theme was rock and roll, including sam cha. 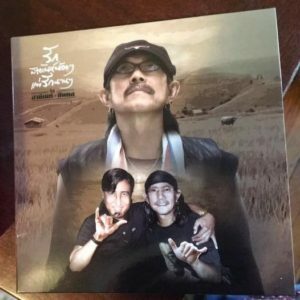 I was thrilled that the playlist included about half the songs on the newest (28th) Carabao album, including my new favorite “Santana Carabao.” A totally amazing version of that song was played that night, better than on YouTube or the album itself. 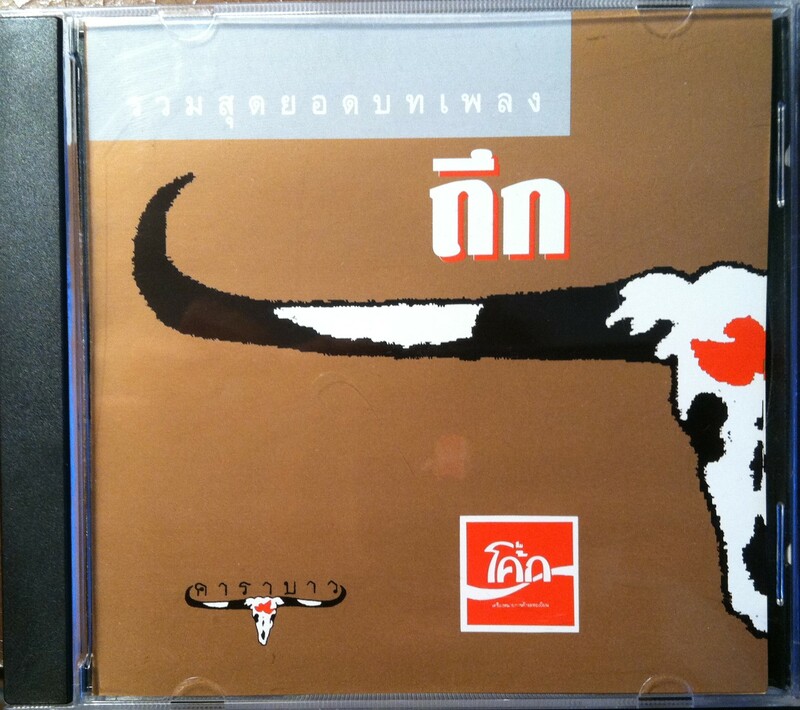 I was also delighted to hear my old favorite “Me Kow Dee Ma Bok” มีข่าวดีมาบอก which I haven’t heard in forever. Unlike the 30th anniversary concert, there was almost no audience. 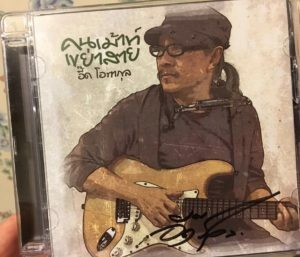 This was a concert at Aed Carabao’s home in Sattahip and they did it all for a very lucky, very exclusive group of about 50 people, it looks like, plus those of us who buy this DVD. It was P’Aed’s birthday that day and he appears to be in a great mood, and was sounding great. These days it’s hit or miss with his voice, but he was on that night. The whole thing concluded with an a loooooong jam session involving about 10 guests who appeared on the stage, rocking out to a song I’d never heard before. I don’t know who all was there, but I did recognize Lam Morrison (honored in the Carabao song “Guitar King”), and there were several others almost up to his level, plus super-special keyboardist. Some were farang. It felt like the band and their guests were having a party by themselves. I should also mention, that Uan Carabao was amazing that night. So multi-talented. There was one moment when he was singing a solo and playing drums while a saxophone hung around his neck—and then he was playing that sax the instant he finished the verse. P’Lek was also outstanding. And it’s no wonder I couldn’t guess what instruments I was hearing on the last album. I saw Mee Carabao playing something I still can’t identify. Fun, totally great concert. 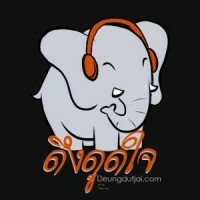 Oh, and Sek Loso was there, and he and Aed did that adorable motorcycle duet: “Elephants live in the forest. Harleys live on the road . . .” You really, really should buy this DVD. BUY IT HERE at eThaiCD, where it is easy for English-speakers to shop. 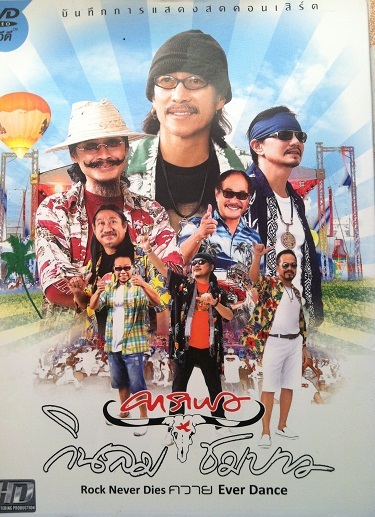 CLICK HERE FOR the CONCERT PLAYLIST WITH links to the translations at Carabao in English!! !